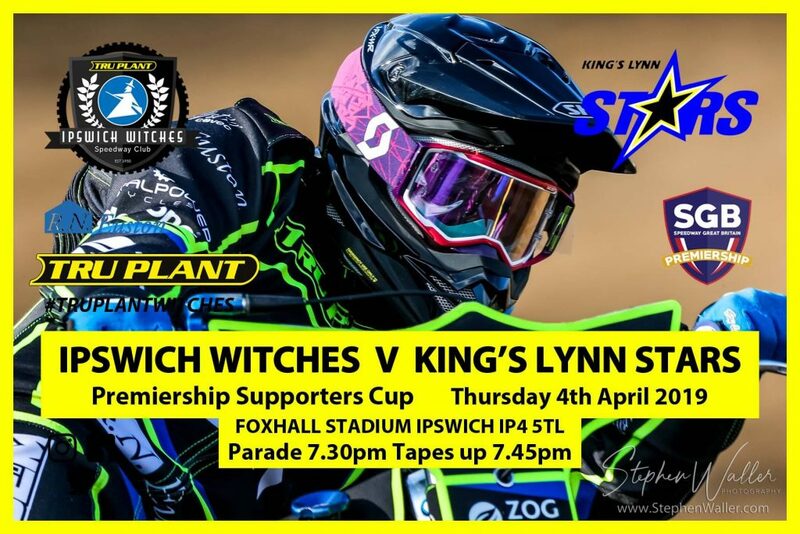 The ‘Tru Plant’ Witches host the King’s Lynn Stars at Foxhall Stadium on Thursday 4th April in a Premiership Supporters Cup clash that starts at 7.30pm. Scott Properties – Scott Properties is a family run, self-funded, and respected Strategic Land Promoter operating throughout East Anglia and the South East of England. Their principal activity is the identification, acquisition and promotion of land through the planning system. They work on a partnership basis with landowners and Local Authorities to realise maximum development potential from land assets. The Witches begin their Supporters Cup campaign against rivals King’s Lynn on home shale as the competitive action begins. The Witches have raced two challenge fixtures prior to this meeting to ensure they are fully ready to hit the ground running in this East Anglian derby. The home side are at full strength for this fixture as Krystian Pieszczek takes his place in the side for the first time having missed both challenge matches due to Polish commitments. It is a meeting that fans of both sides will have looked out for first when the fixtures were released earlier this year as the rivalry is renewed for the first time since 2002. The two sides have both avoided each other since then, both spending time in the Championship but 2019 will see the two teams face each other at least six times. There is no love lost between the two sides as Suffolk meets Norfolk and there have been plenty of fiery encounters in the past and it promises to be a hotly contested clash on Thursday. Local pride is not the only thing at stake though with vital Supporters Cup points on offer. This new competition replaces the old Knockout Cup and the Witches are in a group with the Stars, Poole and Swindon. Teams will race each other home and away with the winner of the group progressing to a two-legged final. There is a twist in this new format too with fans having their say on who represents their team in heat 14 via a Twitter poll, all the details on that here. It promises to be a huge night under the lights at Foxhall, the East Anglian derby is back, and we need your support on the terraces and online. “We will revert to the riding order I originally announced at the ‘Meet the Riders’ event. I have looked at it again quite extensively this week and I feel that it will be the best way to go. King’s Lynn will be looking to go one better in 2019 having lost out in the play-off final to Poole last season. The Norfolk side topped the regular league table and were the standout side but fell short against the Pirates in the final. The club also suffered defeat in the Knockout Cup final as the Somerset Rebels defeated them, but the management have kept faith with the majority of their 2018 side. British champion and Norfolk boy Robert Lambert leads the Stars and the visitors have a number of riders who enjoy Foxhall. Ty Proctor has been a popular guest at Foxhall in recent times and Erik Riss is always a high scorer on his visits to Suffolk. Former Witch Lewis Kerr returns having spent time with the club in 2016 and has proven his capabilities at Ipswich on past visits.